Temporal Face Lift (lateral lift, lateral brow lift) is a variation on a brow lift and uses incisions placed in the hairline at the temples. This technique can smooth out small wrinkles in the forehead, around the eyes and in the area between your eyebrows at the top of your nose. A temporal lift can give a firmer look to the face by lifting and tightening skin around the cheeks. For patients with early signs of mid-facial and brow ptosis or sagging, a full endoscopic forehead and midface lift may not be necessary. For such patients, a moderate degree of lateral brow and midface elevation can be achieved with the temporal lift. 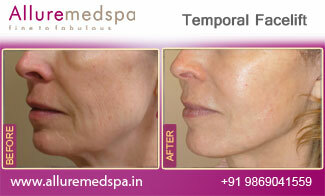 Temporal Facelift offers a more permanent correction and is safe and effective. Early facelifts simply pulled the skin tight, giving an unnatural “wind-swept” look to the face. Modern plastic surgeons elevate the “SMAS” (fat and fibrous tissue) layer to correct cheek jowls. Your surgeon will separate the skin from the fat and muscle below. Your surgeon will then tighten the underlying muscle and SMAS membranes, pull the skin back, and remove any excess. Stitches secure the layers of tissue and close the incisions. 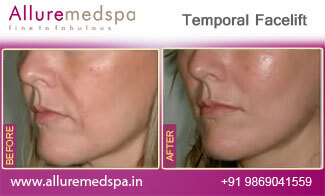 Temporal Facelift surgery is sometimes done on an outpatient basis, under local anesthesia and intravenous sedation. However, your anesthetist may prefer you to have a General Anesthetic. The best facelift candidates have realistic expectations and are willing and able to follow the pre- and post-operative instructions provided by their cosmetic surgeons. Over the first 2-3 days’ period, patients are advised to keep their head elevated and continuously apply cold compresses to the eyes and face. Avoid strenuous activity, including heavy housework, for at least a weeks, limit your exposure to the sun. Above all, get plenty of rest and allow your body heal. To ensure a safe surgical procedure, a thorough medical history is taken to make sure that you don't have any medical conditions that may pose a problem to during your Temporal Face Lift. Having a Temporal Facelift doesn’t stop the clock. However, the effects of your procedure are lasting – years later, you’ll continue to look much better than if you’d never had a lift at all.